Hello Manor House Bride Lovelies! 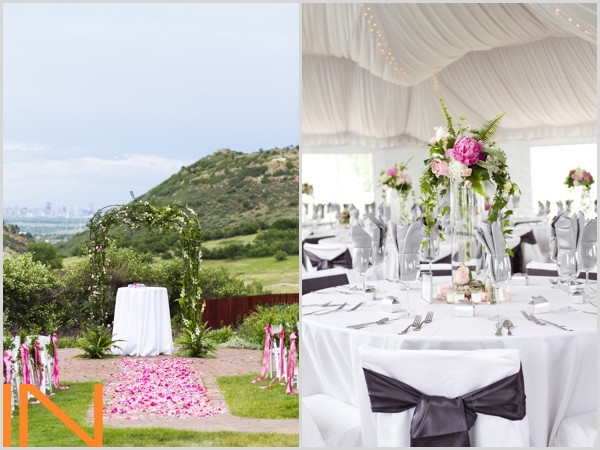 For today’s inspiration tidbit, we wanted to put together some ideas for our 2013 brides for ways to customize the ceremony site here at The Manor House. Over the past 2012 wedding season, we saw bundles of decor glam that turned our ceremony space into a dreamy wedding oasis! So here we go, plenty of wedding ceremony decor ideas found with the Manor House ceremony space in mind! We have always loved it when brides decorate the arch coming onto the ceremony site. It is such an easy way to add your personal touch to the ceremony space. 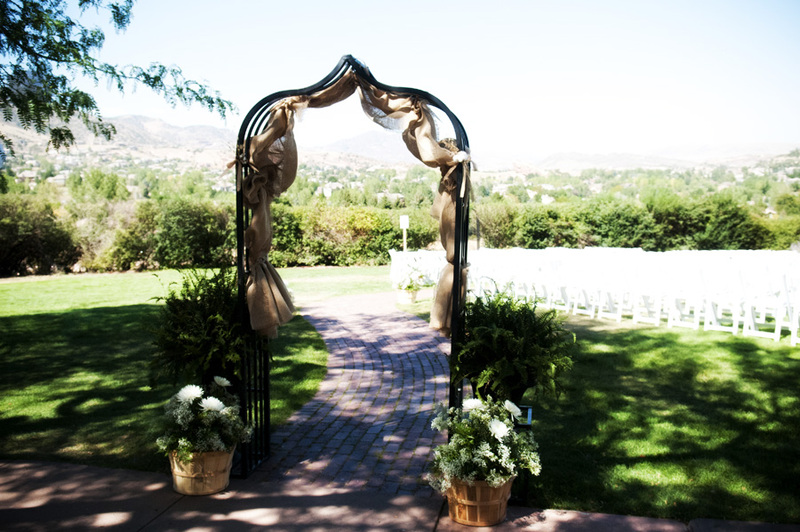 Keep in mind you are also welcome to bring in your own arch to decorate the ceremony space itself, which we must say looks absolutely stunning! 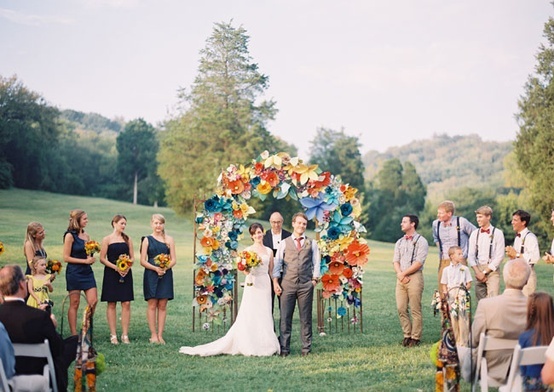 Here are some of our favorite arch decorations from 2012 mixed with a few Pinterest goodies! Oh Brittany and Derek. How we loved these two and their country western chic wedding. We adored how they tied sunflowers into their overall theme with sunflowers on the arch, filling planters, and lining the ceremony space. Another take on the rustic archway decor is to use burlap and baskets. This wedding has not been featured quite yet, but keep an eye out for it because it is a dreamy one! As we are sure you can imagine, this particular gem was published all over the wedding blog world. This archway decor was magical. The decorations in this wedding overall transformed The Manor House ceremony space into a perfectly pink spring wonderland. And yes we know, the tent was to die for as well. We stumbled upon this unique archway decor during one of our Pinterest ventures and pinned it right away. We have never seen an archway so bright, colorful, and personal! We are absolutely in love with this archway decor! It would look so amazing on the archway leading to the ceremony space! Adding decorative elements along the aisle can be a wonderful way to incorporate your wedding theme and colors into your ceremony. You can go the traditional route with flowers, possibly spiced up placed in a unique pot or hung from a fancy shepherd hook. Or, you can opt to go down the less traveled road and do something that might seem cooky at first but can turn out splendidly and one of a kind. Take a look at some of the aisle decorations we have vied for over the past season both from real weddings here at The Manor House and from the wonderful Pinterest world. Shepherd’s hooks are a great way to add a decorative element to the aisle because they add height and above all make for delicious eye candy for your guests. These adorable little bulbs complete with pastel pink tulips and babysbreath were the perfect touch to fit along with Stephanie & Eric’s elegant wedding here at The Manor House. These lovely shepherd hooks tied Megan & Kurt’s vintage theme all together. We adore the look of planters overflowing with your wedding flowers. This particular look worked seamlessly with this rustic themed wedding, but you could choose any planters to fit in with your theme. Keep an eye out for this delish Manor House wedding feature coming soon! Style Me Pretty has us swooning once again. How amazing are these alternative to shepherd hooks? Combined with the stunning succulents and pastel mix? Obsessed. When we say to maybe step out on a limb and do the unique ceremony aisle decor, this is what we mean. This combination of shepherd’s hooks, teacups, colorful fabric, and cheerful flowers is a combo we are sure none of of us have seen before. That uniqueness makes it wonderful, delightful, and makes us vying for more! Being a Historic mansion, The Manor House pairs very well with vintage decor. That is why we are obsessed with the vintage decor that made its way out onto the ceremony space this past 2012 wedding season! 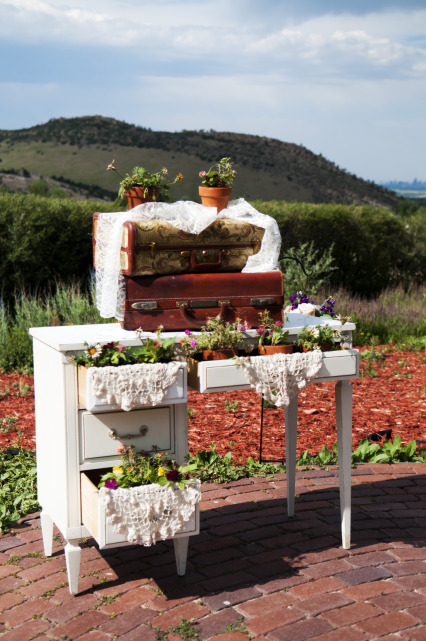 This whole wedding was hands down charming with all of the bride’s DIY vintage touches, but for us the vintage dresser adorned with potted flowers and antique suitcases took the cake. It was such an adorable way to customize the space and tie the ceremony in with the rest of her vintage decor. The best part about this cute little dresser? It can be rented for your wedding day from A Vintage Affair Rentals, along with many many other vintage goodies to give you that vintage look you might be going for! We loved everything about these vintage chairs on the ceremony space for Kristin and Josh’s breathtaking wedding this summer. Not only did they add a vintage flair to the ceremony space, but when placed next to the tables in the tent they turned the space into a dreamy vintage fairytale! Isn’t the archway the sweetest too?! Again we’re giving out a sneak peak to this wonderful rustic wedding feature! We just can’t help it, we’re too excited to publish this one and we think we’ll have to get it up soon! But, our rambling aside, we adored the puff balls that hung in the tree at this morning wedding over their brunch buffet. It was absolutely breathtaking. Isn’t this hot air balloon the sweetest thing? Imagine a few of these hanging from the ceremony tree! We hope today’s inspiration post gave you some fabulous ideas to make the ceremony space your own! Which one was your favorite? We’d love to hear! To see more ceremony decor inspiration and other wedding decor goodies, visit our Pinterest: The Manor House Bride Pinterest.